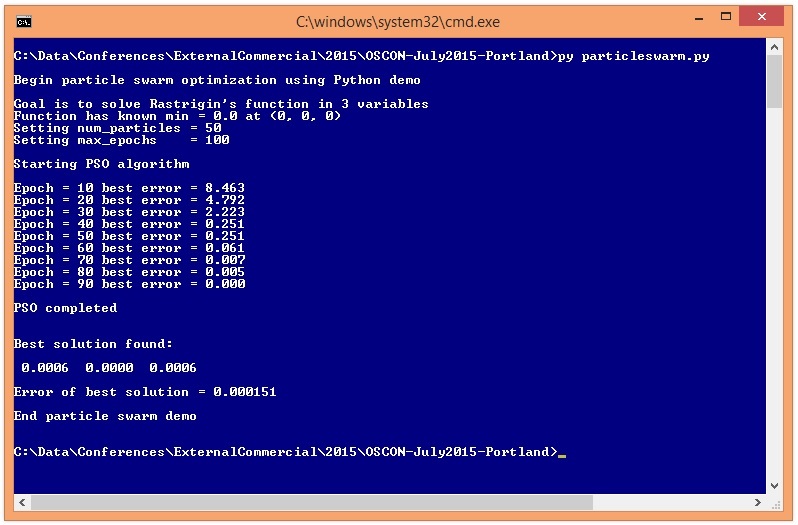 Particle swarm optimization (PSO) is a technique to solve a numerical optimization problem. A numerical optimization problem is one where the goal is to minimize some error term (or, more rarely maximize some value). For example, suppose you have some math equation that predicts the score a football team will make in an upcoming game, based on the team’s current winning percentage, and other predictor variables. You must find values for the constants that make up the prediction equation. If you have historical data with known predictor values and known actual scores, numerical optimization would find the values for the constants so that the error (actual points scored compared to predicted points scored) is minimized. In many problem scenarios, there are techniques based on classical calculus or matrix algebra you can use for numerical optimization. But for some problems, these standard techniques don’t work well and that’s where PSO comes in. In PSO, you have a set of “particles”. Each particle represents a possible solution. Particles move towards a new location/solution based on 1.) their current direction, 2.) the best location/solution they’ve encountered o far, and 3.) the best location/solution that’s been found by any of the particles in the swarm. I coded a PSO demo program that solves a standard, very difficult, benchmark problem called Rastrigin’s function. best_swarm_pos = [0.0 for i in range(dim)] # not necess. # is new position a new best for the particle? # is new position a new best overall? PSO isn’t guaranteed to find an optimal solution to a problem but often works remarkably well.